Naija End Gooner: BREAKING NEWS! RVP HAS JUMPED SHIP!!! This is an update for the fans about my current situation. I have kept quiet all this time out of respect and loyalty for the club and as agreed with Mr. Gazidis and Mr. Wenger, but since there is so much speculation in the media, I think it is fair for you guys to know what’s really going on at the moment. and Mr. Gazidis after the season. This was a meeting about the club’s future strategy and their policy. Financial terms or a contract have not been discussed, since that is not my priority at all. I personally have had a great season but my goal has been to win trophies with the team and to bring the club back to its glory days. Out of my huge respect for Mr. Wenger, the players and the fans I don’t want to go into any details, but unfortunately in this meeting it has again become clear to me that we in many aspects disagree on the way Arsenal FC should move forward. I’ve thought long and hard about it, but I have decided not to extend my contract. You guys, the fans, have of course the right to disagree with my view and decision and I will always respect your opinions. I love the club and the fans, no matter what happens. I have grown up and became a man during my time with Arsenal FC. Everybody at the club and the fans have always supported me over the years and I have always given my all (and more) on and off the pitch. I am very proud of being part of this fantastic club for the last 8 years. As soon as Mr. Gazidis is back from his 2-week holiday in America further meetings will follow and I will update you if and when there are more developments. While I'd tried to steel myself to this possibility, I have to admit that I always thought RVP will be different. While he stalled on holding talks to renew his contract I believed he just wanted assurances on the direction of the club. Hasn't this club been patient with him while he spent more than half of his eight years here in crutches? Then he has one good season and believes he can tell the club what to do. I believe the club has done enough business to show any doubters that they are serious about becoming true contenders once again. 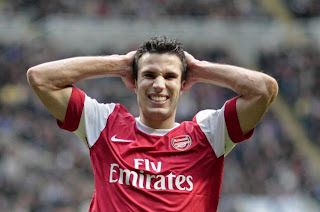 Obviously, RVP isn't satisfied with the much that has been done. Saying "...we in many aspects disagree on the way Arsenal FC should move forward." is utter crap because the reverse meaning of that statement is that RVP wants to dictate the way the club should be run. Nobody's that big! Not RVP. Like I've said here before, let's cash in and move on. I don't share the sentiment that we should punish him by making him stay for the remaining year of his contract. I don't think it makes business sense to do that. We can invest what we get on a long term prospect. RVP is 29 and still injury prone. Let him go! Got to stop ranting now. He should be made to see out his contract and hopefully he'll get another long term injury. that idiot should be made to see his contract through. does he think we are stupid?